What end result do you expect from every single promotional activity? Let’s say you write a blog post. You’re very active on social media. You respond to people’s feedback. Essentially, it’s all about selling more of your products or services. According to the State of Inbound 2018 report, selling is the aspect that most companies prioritize. 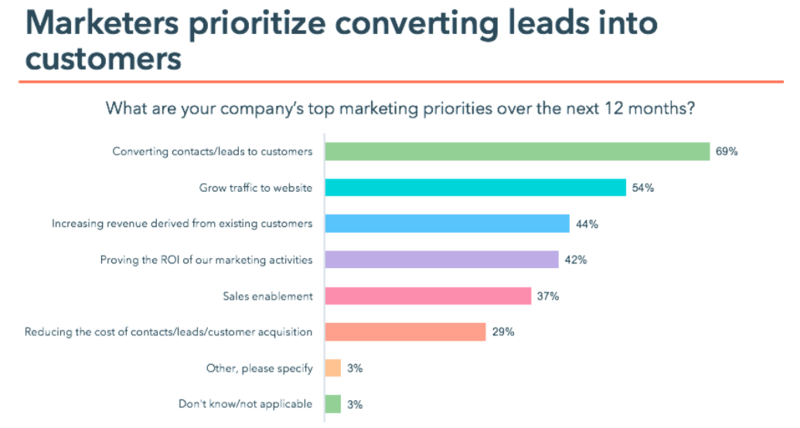 69% of the respondents identified “converting contacts/leads to customers” as their top marketing goal. Are you achieving that goal? Truth be told, there’s always space for getting better. Well it’s time to do all the right things to skyrocket sales. We’ll give you 12 really effective marketing tips that will get you there. You want to sell more? Be there for everyone who’s interested in your products or services. Be there for the previous and current customers, too! You want them to be happy, so they will recommend your brand to others and will come back for more purchases. Hire the right people. You want highly motivated agents who care about the business goals. To get the best customer support agents in the industry, you need to pay them more than the average. Be present on all channels. People will contact you via email, social media, phone, and the official website. Make sure everyone gets a timely response. Establish the rules for returns and refunds. You want to keep the customers happy. If they are not happy with a product, you should solve the issue ASAP. Well if your product or service is good, of course they will be motivated to pay for it. Why do you think that most apps and services offer trial periods? Netflix, for example, invites everyone to try the service for free before they commit to it. The similar strategy works with products. When you give away free stuff, people get to try it. If they like it, they will return to you. They will also recommend the product to their friends and social media followers. But who will receive these gifts? You may turn this into a challenge. Whatever product or service you sell, make people compete for it. That’s how you’ll boost the brand awareness and you’ll really engage your audience. 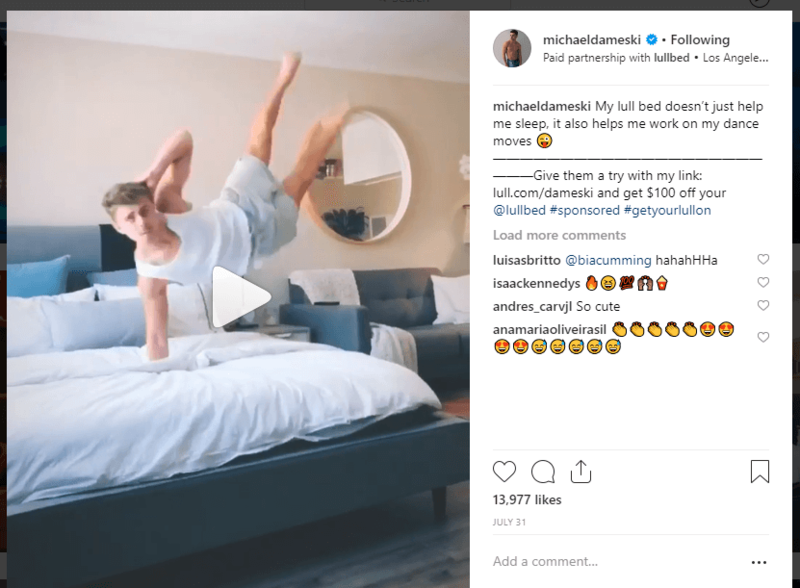 Check out this Instagram challenge as an example: the host invites people to participate by posting yoga poses every day. They should tag the host and the sponsors in each post, so the point of brand exposure is covered. The winners get outfits, free membership on a subscription service, and a book. Yes; the brand has to make an expense for each challenge, but the exposure is well worth it. Behavioral retargeting is an effective marketing strategy, since it aims at people who are already interested in your products or services. Here’s how it works: a pixel on your website informs the ad network that a user visited the page. Then, the ad network will target this user with relevant ads for your product or service. Your ad will start popping up in the user’s Facebook feed all the time. It will constantly remind them that they were interested in this product and it’s still available to meet their needs. Your sales will skyrocket when people start believing in your expertise. Check what Neil Patel is doing. People are not paying for consultations with this guy just because he offers such a service through his website. They do it because he’s an established industry expert. He showed what he could do with websites through his own projects. All his posts convey his level of expertise, so the target audience trusts him. That’s what you want to do. Start the personal branding process. Be present on social media. Connect with people and invite them to ask any questions. Respond with the intention to help. In addition to social media, Quora and Reddit are very effective platforms for personal branding. Start your own blog. Publish high-quality blog posts, case studies, and other types of content that helps you get noticed and recognized as someone who knows what they are talking about. According to the latest stats, 62% of smartphone users have purchased something online through their mobile devices over the last six months. This means that most of your potential buyers enjoy the convenience of mobile ecommerce. You want to make it as easy as possible for them. Invest in a mobile app. When developed properly, it will boost the sales. Pay attention to the way you promote the app. Take specific marketing steps to increase downloads and in-app sales, so you’ll see the real effects. When you get an influencer to promote your products or services, you’re gaining tons of exposure. These are people with large social media following. Their followers trust them even when they know they are affiliated with brands. That’s because the reviews and recommendations they post are thorough and based on personal experience. Obviously, this is paid partnership. That fact is clearly outlined in the Instagram post. Still, it’s an effective marketing step because the followers are more likely to trust shared experience than a traditional ad. Content is the essence of successful online marketing. When posting on social media, you’re creating content. When you want to make your website better, you develop content. When you want to inform your audience about the products and services you sell, you create content. When you want to rank well on Google, you develop content. Your entire marketing campaign depends on the content you develop, so you better make it good. Maybe it will be necessary for you to invest in photographers, graphic designers, and SEO writers. It will be a significant investment, but it will give you great results when planned properly. The website is the face of your business. No marketing trick could make up for the damage a bad website creates. It has to be responsive, clean, and easy to navigate. Start by examining successful ecommerce sites, such as Amazon. It’s really easy to use the search bar when you want to find a particular product. The categories are also detailed. The website is your biggest investment. Hire a great team and keep in mind: the best professionals don’t drop the price because they know how much they are worth. 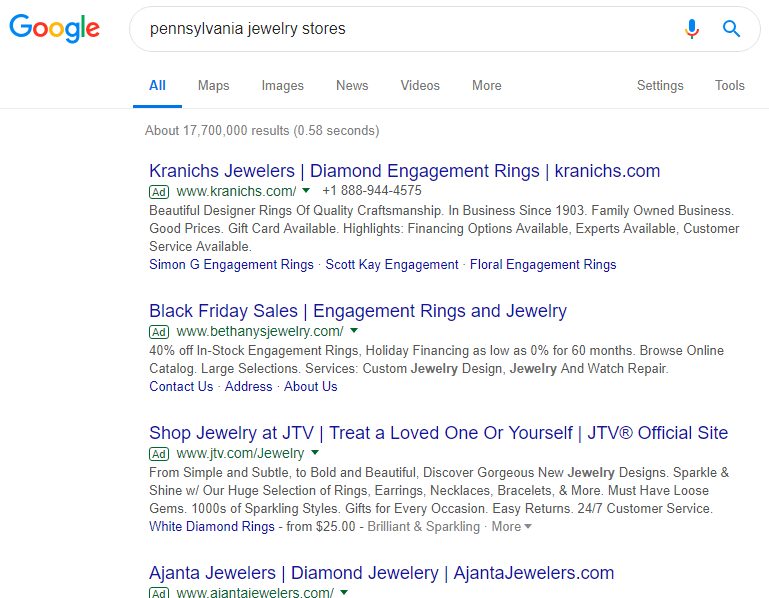 Let’s do a simple experiment: we’ll search the keywords “Pennsylvania jewelry stores” in Google. The search engine will give us the results, but will also include several ads at the top. That ads are the very first thing you see. Chances are, if you’re really looking for jewelry stores in Pennsylvania and you get a relevant ad, you’ll click on it. These ads will cost money, but they can produce great return of investment. Google targets them very carefully to users who are likely to make the purchase. Speaking of Google, you want your website featured on the first page of results. Search engine optimization strategies will get it there. SEO is not easy. If you have no idea where to start, it would be smart of you to take an online course. If you realize you need a team to take care of this step for you, you can hire an agency or hunt for talented freelancers through Upwork or other platforms. 90% of customers say that product videos helped them make a buying decision. By 2019, 80% of all web traffic is expected to be taken over by video content. Adding videos to promotional emails may enhance the click-through rate by 200-300%. You gotta invest in high-quality videos. You can film them in the form of ads for Facebook. You may engage influencers to promote your products through Instagram and YouTube videos. You can connect with popular YouTubers, who will film elaborate reviews. The opportunities are endless. Before people buy your products or services, they will want to see the reactions of real buyers. If someone wants to get an antioxidant supplement, they will make comparisons between the reviews for different products. They will get the one that achieved the best satisfaction levels among the customers. You want to get such social proof for your brand. First of all, it’s important to offer a great product/service that meets the buyer’s expectations. The customer support system, packaging, and speedy delivery also matter. Invite your customers to share their opinions. Allow them to review the product on the official Facebook page. Feature the best testimonials on the website. Of course you want to boost the sales. But are you ready? 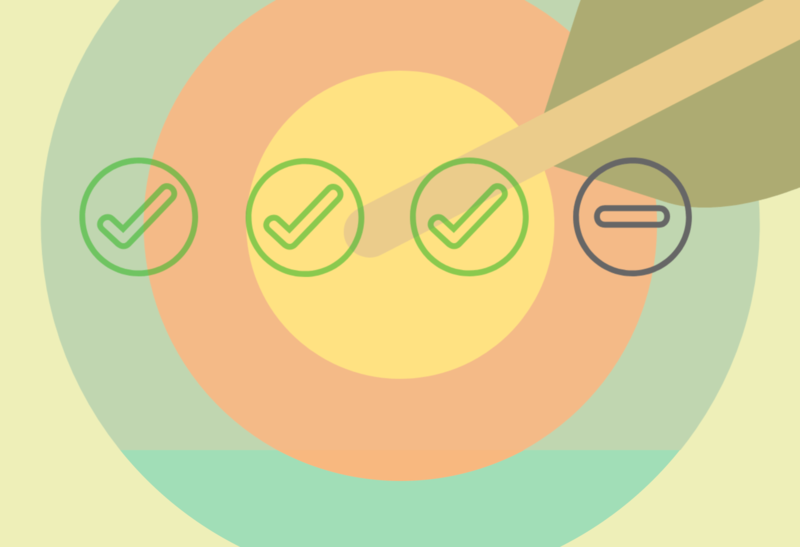 The question is: have you done enough effort through your marketing campaign? We gave you 12 great tips on how to get to the results you want. Now, it’s your turn to take action. Patricia Wilson is a blogger at Scholaradvisor.com and Superiorpapers.com and SEO practitioner. Marketing is her main interests. It’s amazing to see a startup rise with the speed of light. That’s why she’s willing to share her knowledge and experience with anyone who wants to develop a successful marketing campaign. In the meantime, Patricia is committed to the goal of getting her MBA degree.